The legendary MPC brand is reborn in a form that aims to marry its famous hands-on ethos with the unlimited possibilities of the software world. Does the combination work? 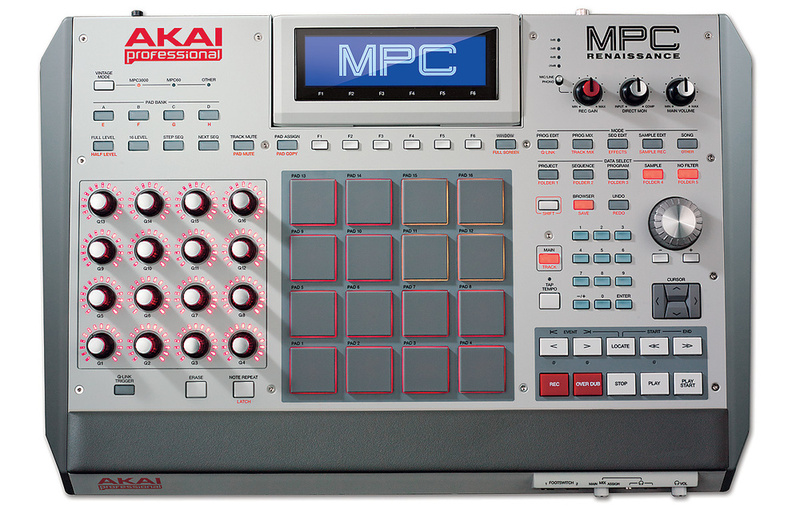 It seems like Akai's MPC range has been around forever, revered for solid sequencing, a straightforward interface and no-nonsense sampling. But after a long reign and many hardware generations, not even Akai can resist the vast and constantly shifting world of computer-based production and its DAWs, virtual instruments and gargantuan sample libraries. I don't know if it grated when Native Instruments' Maschine appeared, applying MPC-like control to all those desirable software elements. If so, maybe the Renaissance marks the moment the empire struck back. The Renaissance has the look and feel of quality stand-alone kit, yet it functions exclusively as a controller for a software host running on your PC or Mac. Not content with that, it serves as a 24-bit, 96kHz audio interface with multiple MIDI ports, too, while backlit pads, assignable Q-link controls and buttons galore offer maximum tactile gratification. Those who don't need a new audio interface, or simply want to save a few bob, should check out the MPC Studio. Due soon, it's a trimmed down version that dispenses with the audio capabilities and multiple MIDI ports of the Renaissance. Claiming backwards compatibility with previous MPCs and largely consistent with their workflow, could the Renaissance be the gateway drug to lure more hardware freaks into a world inside the box? The Renaissance's back panel is awash with socketry and offers dual combi jack/XLR inputs, the traditional MPC phono inputs, stereo and assignable outputs on quarter-inch jack, and a generous four MIDI outs. I doubt anyone will be seriously disappointed with the Renaissance hardware, from its 16 pert and weighty encoders to the tough grey pads with coloured back-lighting. It's a hefty machine and it looks built for action. The tilting blue screen is adequate, its 360 x 96-pixel resolution delivering retro small text and basic graphics. For some operations, a mouse and monitor are far more inviting, but the transport and navigation controls are superb, the solid output of years of MPC evolution. Weighing in at a shade under 5kg and occupying a generous 50cm x 33cm x 7cm of desk space, the Renaissance's cold metal base is framed in grey plastic. Running your eyes and hands over the smooth surface, there's no sign of skimping, from the many dedicated buttons and numeric keypad to the reassuringly balanced data wheel. There's even a padded wrist-rest! Intent on covering every base, Akai have provided front-facing headphone jacks in both regular and miniature versions, capable of monitoring the main mix or individual outputs. Unusually, two footswitch sockets also reside at the front, although when you check the rear you can see why: it's chocka! Akai have opted for six MIDI sockets in total; two In and four Out. This maintains the legacy connection with existing MIDI rigs but gobbles up a fair proportion of the available space. It means that there's only room for two assignable audio outputs, in addition to the main stereo pair. This is in marked contrast to, say, the MPC5000, which had eight. Further connectivity is present in the form of 24-bit digital I/O, plus phono inputs (complete with preamp) and two combined XLR/balanced jack inputs with phantom power. Considering that the Renaissance is focused on working in the software domain, two assignable outputs might be enough. There's a nod towards the sound of previous machines, courtesy of various 'vintage' emulations in software, the current models being the MPC3000, MPC60 and SP1200. The I/O converters are designed to the same specifications as the MPC3000, although higher sampling rates and bit depths are accepted. The Renaissance takes the unusual step of incorporating a USB 2 four-channel audio interface. It also has two USB 2 hub connections, suitable for external drives or the direct connection of USB controller keyboards. Finally, power is supplied by an external 12V adapter, as the 2A requirement is too much to pull over USB. Each pad has up to 4 layers with velocity windows, insert effects, a filter and more. The software installation process is frustrating if you prefer to control what goes where on your system. The Renaissance ships with around 9GB of content, but (as of version 1.1) doesn't offer you a choice of where it goes. During the Mac install, it plonked the lot on my system drive! Also, the software won't work without the controller connected. This seems an unnecessary restriction; I'm thinking of those occasions when you want to pop open the laptop to make a few quick tweaks. Having installed and then authorised the software, there's nothing to hold you back. With no showy demos to admire and an overly anorexic Quickstart Guide, it's the Acrobat-based manual and online videos that provide the necessary sustenance. Although the manual's lack of index and occasional contradictions suggest that it was hastily written, at least there's help in getting started. Those without prior MPC experience will appreciate the tour through operations, some of which don't fall naturally into place. Seasoned MPC users will probably get by without the manual, but even rookies shouldn't take long assembling their first program — MPC terminology for a collection of samples spread across the pads. A program is created by importing samples via the excellent File Browser, its five stored locations ideal for rapidly accessing your favourite folders, whether these are Akai's own content or user samples and projects. The view is filterable for the assorted file types the Renaissance can handle. A program may be either a Drum or Keygroup type, the first notable for individual processing of each drum voice, the latter designed to spread samples chromatically over a range of keys. With an impressive eight pad banks (A-H) to populate, a kit can contain up to 128 different drums, and each pad offers insert effects and up to four sample layers that are filtered, transposed, given velocity windows, and more. The filters are varied and of fine quality, with velocity control the icing on the cake. To add extra nuances to your kits, Layer Play mode has options to randomly select or cycle through the samples layered on each pad. Even before we consider sampling, it's fair to say that the MPC's 128-note polyphonic sound engine is a cut above, but it's plug-ins that set this model apart from its older cousins. After all, there are some seriously pumped-up virtual instruments in circulation, and this MPC is itching to get at them. 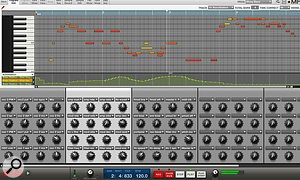 Initially, the presentation of VST and AU plug-ins isn't particularly helpful. Some are listed multiple times yet look identical: for example, when a plug-in exists as different versions with varying numbers of outputs. Having added a plug-in to a track, you access its patches and controls as usual via its own interface. However, here's where those handy Q-Link encoders play a blinder, because the plug-in parameters available to your DAW for automation are instantly, magically and effortlessly allocated to them. Switch into Program Edit mode to see up to six pages of these tweakable parameters, their values shown by the neat LED collars around the encoders. The automatic parameter mapping can easily be overridden, and you can gather your favourite 16 controls to make them available whenever you select the track. Incidentally, had you chosen an external MIDI instrument instead of a plug-in, you'd see pages of MIDI CC numbers. In an ideal world you'd be able to replace these numbers with the parameter names of each synth. Time for a feature request, I think. Samples may be chopped into slices that are easily mapped across the pads for instant performance. Fully tooled-up to compete in Feature Wars, the Renaissance's armoury is stocked with 128 tracks and up to 128 sequences, each up to 999 bars long. A sequence can theoretically be an entire song, although it's more likely that each one will be a manageable chunk of music of several bars. 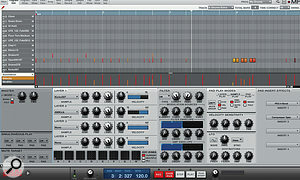 Sequences can be arranged into songs or triggered manually during performance. Despite Akai's foray into the software/hardware borderlands, some operations still fall naturally — and sometimes exclusively — to one place or the other. After allocating several instruments to tracks and recording some pad hits, you're ready for the next step: making a variation. Contrary to the structure of most DAWs and similar software, track and instrument pairings are unique to each sequence. Rather than laboriously setting the tracks up for every sequence, I gazed at the software, wondering how to copy and paste them. Frustrated, I eventually turned to the hardware and instantly spotted the 'Seq Edit' button, behind which are the necessary tools. However, I soon discovered a strange anomaly: every copied sequence replicates every instrument it uses. 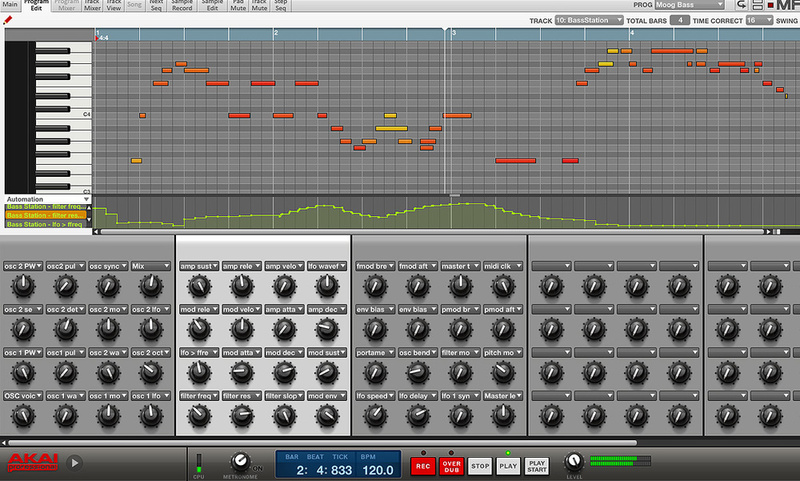 After only a few sequence copies you're knee-deep in copied instruments! Not only is this wasteful and confusing, it's dangerously uncool when working with demanding synths like Omnisphere or Diva. The situation grew worse as I piled on the plug-ins and began to experience crashes, random silences and other instabilities. Treading carefully, I searched around the hardware for a few traditional sequencer functions. For example, my sloppy finger percussion called for a degree of quantisation. I eventually stumbled across a tab that's visible when the Main button is pressed: TC. This is Timing Correct — or quantise — and on this occasion I'd have got there quicker scanning the software. Timing Correct includes shuffle and positive or negative time shift, as well as a strength value to apply to the various corrections. As destructive edit operations go, it does the job — and the 'swing' function sounds very nice indeed. Staying with the software for a moment, its pages are accessed via clickable tabs. The first of these, Main, is divided into an arrange window, plus Q-Link and pad assignments, current sequence information and a handy list of the programs and samples used in your project. Whether operating primarily from software or hardware, you'll return to the Main page often, the fastest way being courtesy of a dedicated button. 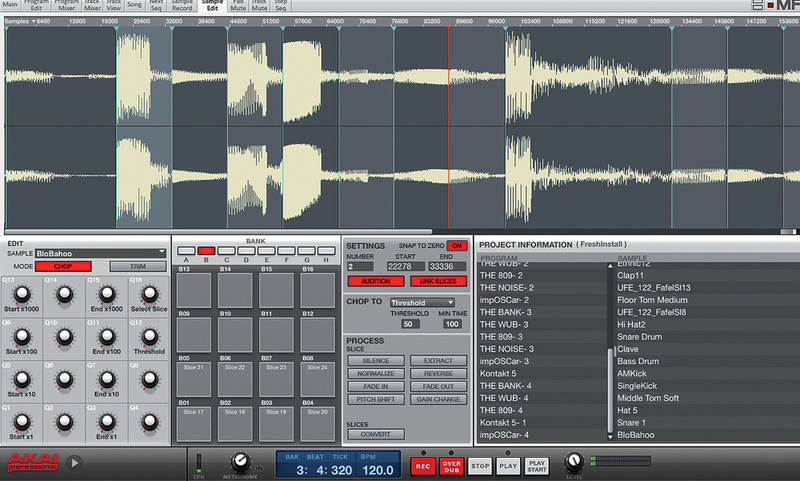 The Track Mixer is a conventional-looking mixer that treats all tracks (as far as possible) equally. Naturally, it can't add MPC effects to external MIDI instruments, but for the internal stuff there are four inserts per track, four stereo send effects and up to eight submix routings. The Renaissance is generously furnished with over 50 effects, ranging from mastering tools, compressors, delays and filters to better than average reverbs. If you can't find what you need, most of your regular plug-in effects should be accessible, although my recent Waves 'Black Friday' purchases sadly weren't. Continuing our random tab tour, Track View is a split screen consisting of a track list and either a piano-roll editor or drum editor, depending on the currently selected program type. To make the best use of screen space, the 'Full View' mode, in conjunction with zoom, crams a fair selection of the 128 possible tracks on-screen. It's still a lengthy list, though, and I couldn't help feeling that some kind of folder system to group related tracks together was conspicuous by its absence. X0X-style drum sequencing is catered-for in 'Step Seq', but missing in action is the older MPCs' much-admired Step Edit. We'll skip past sample recording and editing for the time being, to give Song Mode a quick mention. This is where sequences are ordered into a coherent, finished work. Each project contains up to 32 songs so you can audition different versions until you nail it. Alternatively, it's a range of songs primed and ready to select when playing live. Helpful utilities are on hand to convert whole songs into sequences. A bird's eye view of the Renaissance. At the front right, you can see the two footswitch inputs and the headphone sockets and their associated controls. Before arriving at the perfect song structure, there's a whole load of manual sequence selection and track muting to experiment with first. Would-be performers should make a bee-line for the 'Next Seq' tab, or button. From there, sequences are triggered directly by hitting pads. The pads are backlit in yellow regardless of whether the corresponding sequence has any data in it or not. A selected sequence is shown by green back-lighting, and when a new selection is made it flashes — also in green — until the old sequence completes. There are performance overrides, so you needn't wait for a sequence to end: for example, 'Sudden', which instantly switches to the flashing next sequence. It's a bit unsubtle, though, kicking in from the first bar regardless of the position reached in the old one, which isn't always desirable. Other performance-related options include Pad Mute, in which you've got mute control over individual pads or groups of pads. Ditto for Track Mute, with which you can mute tracks individually or in groups you've quickly defined. Usefully, mute status is remembered from sequence to sequence, and this alone can be an inspiration-booster for song composition. Precision-conscious performers and serial multitaskers will find 'quantised pad mutes' a godsend. Specify the necessary resolution, then hit the pad you want to mute, trusting that it will occur exactly on the beat you wanted. No fluffs, guaranteed! In performance, the pads' coloured back-lighting plays a surprisingly minimal role. Colour highlights the playing sequence or illustrates velocity values or mute status, but it never feels integral to operations. If the light show is understated, at least the pads' velocity and aftertouch are as playable as ever, once you set the sensitivity to suit your finger strength. Note Repeat is present and does what it says on the button, with all actions, repeats and mutes recordable. The only exception I encountered was that parameter tweaks of internal effects weren't recorded. Recording and performing with plug-ins, MIDI instruments and samples from your computer isn't the whole story. MPC users have always enjoyed hassle-free sampling, and in this incarnation they still can. It's blissfully undemanding on the old grey matter, whether grabbing audio from any of the inputs or resampling the Renaissance itself. At times like this, you really appreciate the value of a built-in audio interface: everything needed is close by. At the turn of a knob, you have zero-latency hardware monitoring, and whether you're doing phono, line or microphone-sourced sampling, all you have to decide is whether to set a threshold trigger, how long to sample for, and whether it's stereo or mono. At the moment, you're not offered much choice about the sample format from the Record screen, but I couldn't fault the 24-bit recordings I made. When recording loops, you typically need to trim the results afterwards, and since that's the kind of sampling I do most often (grabbing riffs from hardware synths) I did feel that an option to sample a specific number of bars is needed. Post-sampling, all the usual edit processes are offered, including a chop mode for slicing up loops, a rudimentary time-stretch, pitch-shift, normalise, reverse, and so on. When chopping a sample, you can choose to chop based on transients or at specific musical intervals, the chop process kindly offering to generate suitable note triggers in the sequence. 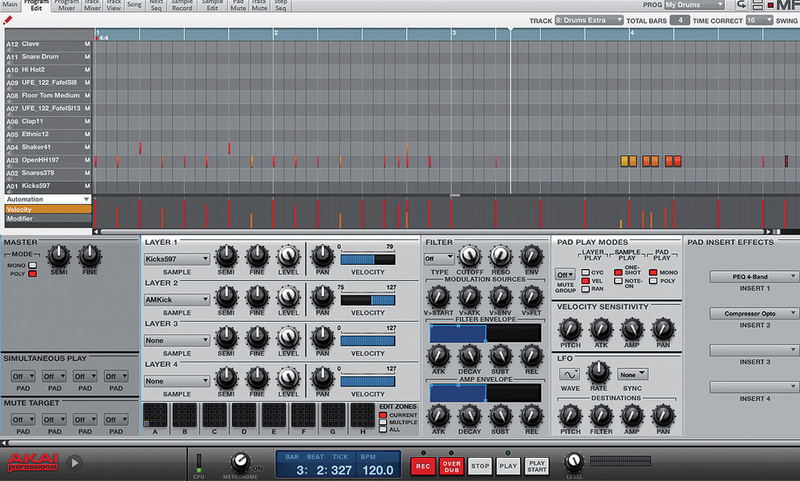 This is never a replacement for fluid, Ableton-style time-stretching, but it has its own appeal. Slices can be processed individually, too, and if I have any criticism, it's that the screen doesn't deal well with long samples. The zoom only zooms out so far, and I could see no way to do it at all from the controller. The Q-Link encoders are automatically assigned to parameters, in this case from my elderly but suddenly-accessible Novation BassStation plug-in. The MPC Renaissance ships with 9GB of samples and programs on a selection of DVDs, including four virtual instruments exclusive to the MPC. These are: The Bank, The Wub, The 809 and The Noise. The Bank is a sample player hogging over half the sample gigabytes for itself. Its selection of 300 instruments are of the sort of general-purpose material found in a typical workstation. The Wub places its emphasis on bass, with LFO synchronisation on hand to inject dubstep wobbles a-plenty. The 809 is, you won't be surprised to hear, a drum machine. It's a decent one too, whether you're a fan of classic Rolands or prefer to explore dark, lo-fi wastelands. With 50 kits supplied, the 809 is a solid and uncluttered instrument that should get well used. Last and possibly least, The Noise is an 8-bit curiosity containing samples from console games or cheap and cheerful toys. The remaining content is taken from previous MPCs. There are numerous loops in .Wav or .REX format, plus percussive hits, synths, and orchestral and world samples, all ready to feed your original programs. Some of the file organisation leaves a bit to be desired, with samples often lumped together in a single folder for you to rummage through. 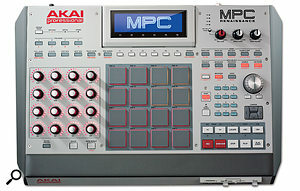 The MPC Renaissance has extensive family ties to older MPCs, but its dependence on a computer host marks a radical departure for the breed. Radical it may be, but it's based on the tried and tested platform of a sampler plus interactive sequencing. When these are combined with everything a computer-based studio offers — those virtual instruments, effects and samples — the Renaissance looks like a highly attractive package. It's further boosted by an integral audio interface and the sheer luxury of four MIDI outputs. Less positively, although the bundled instruments are fair enough as freebies, they don't really make a massive contribution. I would say the content generally is worthwhile but a bit underwhelming. At first I found myself frequently jumping between the controller and computer and felt that some operations were rather outdated. It's clear that the MPC software currently lags behind its promise, and not simply because it's only 32-bit. The instability held me back at first but as my time with the Renaissance drew near to an end, the MPC software informed me that version 1.2 was ready for download. Its notes were brief but promising: "Many bug fixes and stability enhancements, improved software installation procedure.” After a quick installation, my impression of a few hours is that version 1.2 does indeed seem more stable, so fingers crossed! There's still plenty to do, but Akai are already talking about new features in version 1.3, and obviously feel the pressure is on to get it right. There's a lot of history to live up to, but the MPC Renaissance is only at the start of its adventures. Once it beds in, it could easily be everything the MPC classics were, and much more! Native Instruments' Maschine 2 is the obvious alternative, although it's actually a more direct competitor to MPC Studio because that model lacks Renaissance's 'complete package' audio interface. The second-generation Maschine hardware puts colour beautifully in the frame in a way that Akai doesn't, and its PC/Mac roots run deeper, giving it the edge in several areas, notably that it's a stable 64-bit program bundled with well-polished content. It's also simpler, faster and more intuitive. However, if you're already comfortable with the MPC workflow and trust Akai to continue adding favourite features, or if you need four MIDI outputs and prefer to create finished songs, the Renaissance looks very inviting. Mac: 2GB RAM (4GB recommended) Mac OS 10.6 or later, DVD-ROM. Windows: 2GHz Pentium 4 or Celeron-compatible CPU or faster (multi-core CPU recommended), 2GB RAM (4GB recommended), Windows 7 (32- or 64-bit), DVD-ROM. Review version: 1.1 (1.2, bug fix version now available). Mac Pro running OS 10.6.8, 12GB RAM, 2x2.66GHz quad-core Intel Xeon. 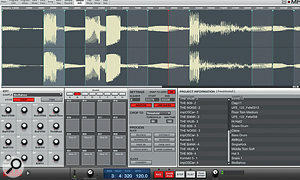 Occasional review DAW host: Logic 9.1.8 in 64-bit mode. Taking a leaf out of Native Instruments' book, which is probably fair under the circumstances, the Renaissance software runs either stand-alone or as a plug-in within a DAW. Version 1.1 introduced RTAS compatibility to keep Pro Tools users happy, with VST and AU present from the start. There's no drag and drop of MPC sequences to your DAW arrange window, but the export options are very flexible, whether for individual tracks or complete songs. Currently, the MPC software is only 32-bit and single core, which caused the usual issues for me as a Logic user. There's a YouTube tutorial on running Logic in 32-bit mode; it also discusses the control of Logic's transport controls from the MPC. Personally, I find 32‑bit a compromise best avoided and can't vouch for performance under other DAWs. Despite having designs on your favourite virtual instruments, Akai have kept hardware synths high on the priority list with those four MIDI outputs and two inputs. Other than that the program-change field and its full bank-select fields (i.e both LSB and MSB are at your disposal), there isn't much to say. But in an era of resource-hungry soft synths when sometimes you're counting the notes in a chord in case the CPU complains, it's refreshing to connect up older gear and sequence it painlessly alongside your VST instruments. The MIDI interface remains accessible even without the MPC software running. An MPC sequencer for your computer-based instruments, effects and samples. Features a quality audio interface and multi-port MIDI. Add a laptop and you're ready to take on the world. Backwards compatibility with previous MPCs and Akai samplers. Some crashes and intermittent errors throughout the review period. Software is 32-bit, single-core and only works with hardware connected. Software/hardware divisions are not always obvious. 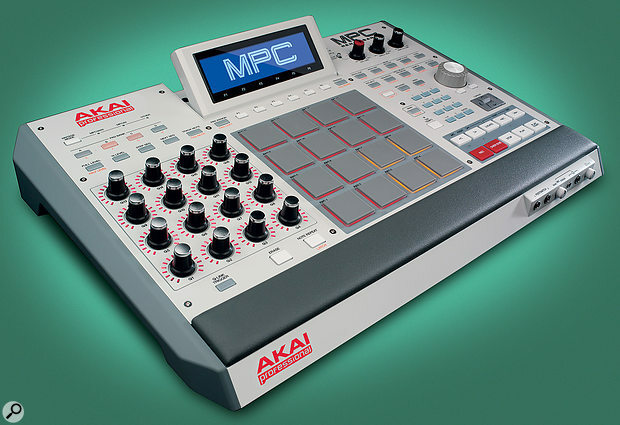 Akai's MPC range has ruled the hardware roost for a long time when it comes to sampling and sequencing. Putting that experience into a controller with computer-based software is an ongoing exercise, but when the software maturity matches the hardware, the Renaissance should be the best MPC ever. Akai +1 401 658 4032.